Yes, the last N-series we saw was many, many years. And for the Techies, the Nokia N-series journey stopped at Nokia N-9, which ran on MeeGo v1.2 Harmattan OS. Nokia however teased one of it N-series device today, which is a pointer that sooner or later, the Finish giant might resurrect it N-series smartphone again. 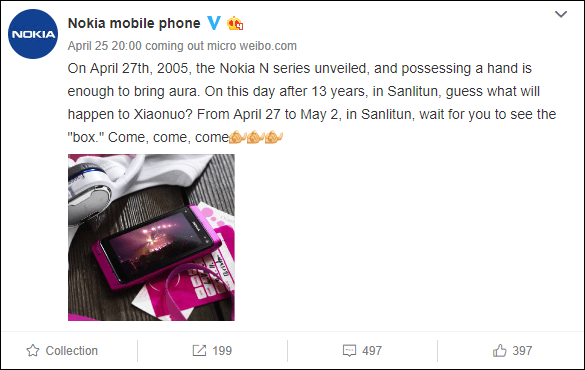 The teaser image which the company shared via weibo, is currently trending online, and if the rumors tuned out true, Nokia might announce a new smartphone in the N-series on 2nd of May next month. The company will likely launch the device on May 2 in an event billed to hold in Sanlitun, Chaoyang District, Beijing, China. The Weibo post also comes with an image of what looks like the Nokia N9 which was launched in mid-2011, but since Android was not used then, who knows, perhaps, Nokia want to show fans the ability of the N9 when paired with Android OS in 2018. But the question now is, are we going to see the older 3.9 inches display and 1 GHz Cortex A8 TI OMAP 3630 CPU on the rumored new comer N9 (2018)? Certainly not. But since nothing is known so far about the device specs and features, it nice to keep our speculations pending when few specs are teased. Nokia from 2017, starting relaunching it old smartphone series staring from the base model Nokia 3310. The company had also disclosed it plans to relaunching the Nokia X series with the Nokia X6, which is expected to go official in China on the 27th of April.